Written by Administrator on 30 August 2017. The recent report by the Committee for Economic Development of Australia (CEDA) highlights the importance of improving planning systems and in providing infrastructure, says the Urban Taskforce. “The Urban Taskforce supports most of the recommendations from the CEDA report on Housing Australia and appreciates the excellent input by the individual authors." Special thanks to our 2012 sponsor for their support of these Awards. The Annual Dinner and Development Excellence Awards were held on Thursday 26 July 2012 in the Doltone House, Jones Bay Wharf venue at Pyrmont Point. 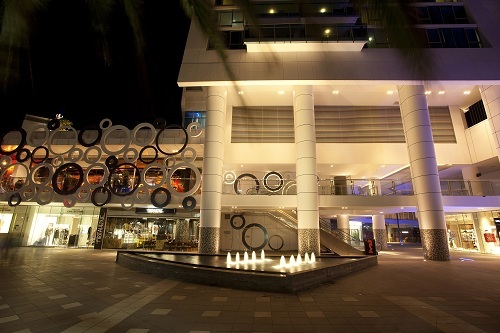 The Development of the Year 2012 was Hilton Surfers Paradise Hotel and Residence, by Brookfield Multiplex Constructions. The Taskforces awards acknowledge development projects that achieve the best outcomes in terms of client requirements, environment, business and community considerations; as well as time, cost and quality. These awards recognise the crucial role of the developer in making a new development an outstanding success. The 2012 winners are set out below. 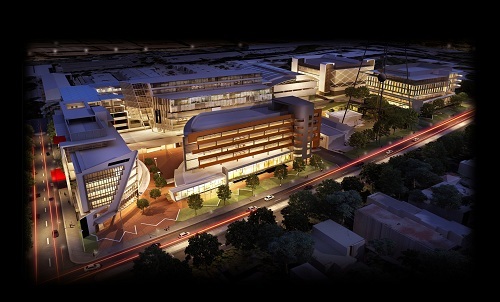 The jury was impressed by both the design and the procurement process for the Hilton Surfers Paradise. The project with a previous developer had run into financial difficulties and Brookfield Multiplex collaborated with the ANZ bank to save the project. The developer overcame the financial, legal, technical and delivery hurdles to make this project happen. The Project has 2 distinctive architectural high rise towers including the 33 level Boulevard Tower with 186 apartments and the 57 level Orchid Tower with 224 apartments and also a 169 room Hilton Hotel. The rescue of this project had a ripple effect into the property market of the Gold Coast in a positive manner. 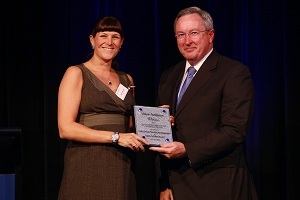 For its design quality and its economic performance the Hilton Surfers Paradise Hotels and Residences is a worthy winner of the Urban Taskforce Development of the year. Kevin Gogolka (right), Senior Development Manager- QLD from Brookfield Multiplex Constructions, accepting the award from Minister Hazzard. The Employment Business Park development award goes to The Gore Hill Business Park at Artarmon. The jury was impressed with the design of this building, with its interesting diagonal bracing and its architectural detailing. Rain water is harvested and stored in underground tanks and used for the irrigation of landscaping and for the flushing of toilets. The data centre establishes Gore Hill Business Park as a centre for high technology and this has started the rejuvenation of non-productive land since the departure of the ABC over nine years ago. A community shuttle bus is provided and an indoor soccer field and 3 indoor basketball courts. Externally a 3000 sq. metre landscaped park as well as a one kilometre jogging track are provided. 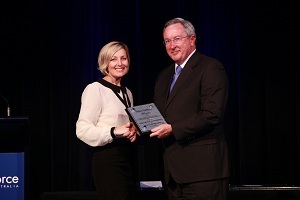 Susie Sloan (left) from Lindsay Bennelong Developments, accepting the award from Minister Hazzard. 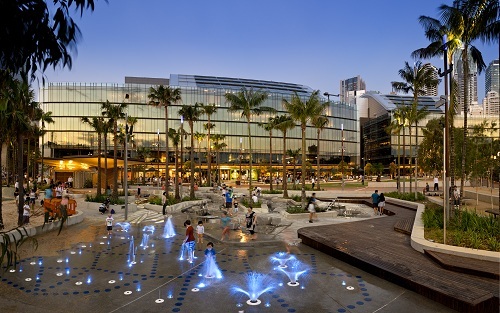 The Darling Quarter located at Darling Harbour is a worthy winner of the Commercial Development Award. The jury was impressed with the quality of the commercial spaces and the tenancy fit outs. Even more impressive is the relationship between the building and the public domain with a series of restaurants flowing into a large play area for children. The play area seems to be very popular all year around and is an excellent contribution by the project to the community. 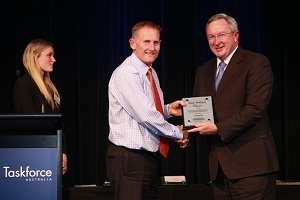 David Rolls (left), Managing Director, Inner Urban Development from Lend Lease accepting the award from Minister Hazzard. The North lakes estate at Cameron Park by the McCloy Group is an excellent example of a new housing estate that works with the environment while providing quality housing. The estate is well located and has provided 130 hectares of environmentally protected open space as well as a child care centre, retirement village, numerous childrens play grounds and access to public transport along with a new community centre. The project has been a commercial success with the average home- site price in 2001 being $85,000. This has risen today to $190,000 demonstrating excellent capital growth. The McCloy Group has partnered with eco- friendly house builders leading to energy and water efficient house designs. 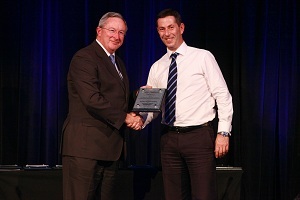 Brian Swaine (left), Managing Director from McCloy Group accepting the award from Minister Hazzard. The Retail Development Excellence Award goes to Coles at port Macquarie. The building is designed in an art deco/ nautical style appropriate for the buildings location. The facades to the street incorporate significant areas of glass. The building was lifted above the 1 in 100 flood level and natural light through the use of extensive glazing has minimised lighting costs. Overall the project is a successful addition to Port Macquarie and has been a commercial success. Joanna Russell (left), Development Manager from Coles Group Property Development accepting the award from Minister Hazzard. The Beach House is a well-designed series of apartments located on Campbell Parade Bondi Beach. The new building wraps around an existing hotel and provides a new arcade connecting Campbell Parade to Gould Street. The sale of apartments has been very successful. The jury believes that the beach house is an excellent apartment development. 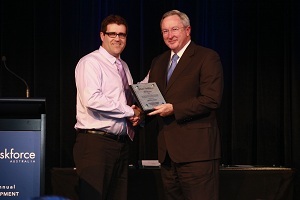 Graeme Katz (right), Head of Property from Investec Property Limited accepting the award from Minister Hazzard. The Gallery at Botanica is an adaptive reuse of buildings designed originally by architects James Barnet and Walter Liberty Vernon. The adaptation to these buildings retains their character while ensuring new uses occur. These heritage buildings have been converted into modern housing with all the facilities expected in a new building. There are many environmental features and clearly the residents enjoy the precinct. 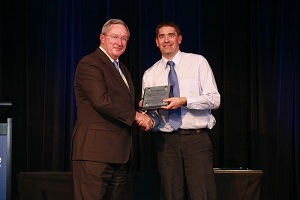 Adrian Arnaudon (right), Development Manager from Australand Property Group accepting the award from Minister Hazzard. 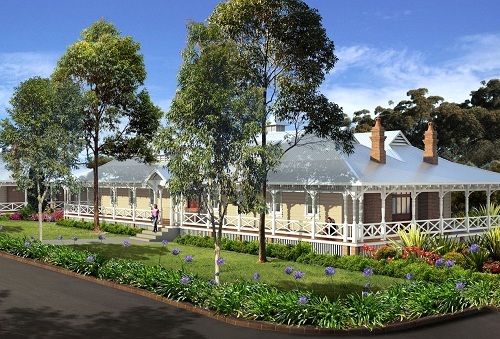 The Ponds development in the North West of Sydney is a partnership between Landcom and Australand which delivers specially designed homes to meet affordable or moderate income housing targets. As well as producing affordable housing, a high level of design has been achieved. The National Rental Affordability Scheme (NRAS) has enabled larger housing sizes to be produced. The jury was impressed with the commercial success of the project as well as the design quality. Carmon Osborne (left), Development Director from Landcom and Raymond Baksmari (right), Development Director from Australand accepting the award from Minister Hazzard. 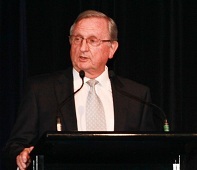 "I am especially pleased to have been invited to chair the Development Excellence Awards for the Urban Taskforce in 2012. I have been impressed with the quality and clarity of the submissions, which lead to vigorous debate amongst jury members. All projects submitted should be applauded for the contribution they are making to an improved and sustainable built environment across the nation. It was refreshing for me to assess projects using a broad range of criteria which reflects my philosophy that good design and creative thinking need to be applied throughout a project, for a project to be truly successful. Creativity equally applies when regarding a projects urban context, its architectural merit, its commercial success, environmental credentials and importantly how a community will benefit and accept the changes which development invariably brings. Most of the projects assessed in 2012 were conceived during difficult financial circumstances. It is a credit to the industry that you have continued to innovate and develop quality projects during this time. The truly creative and dogged amongst you have come up with innovative and successful projects. It is a testament to the entrepreneurial spirit that the people taking the risks to advance projects during these times, the developers, have succeeded. Congratulations to the Urban Taskforce for recognising the achievements of the development industry. The award process acknowledges the hard work and intelligent creativity necessary to achieve success. Furthermore, these awards recognise the many people that contribute to projects and their contribution to the quality and success of those projects. However most importantly these awards celebrate the developer who has had the vision and drive to bring the right team together to deliver a project which succeeds on many levels; aesthetically, commercially, environmentally and socially."